The 51m metre motor yacht Alibi, listed for sale at Burgess, has been sold with Axel Douqué at Ocean Independence introducing the buyer. Designed by Paolo Scanu and Luca Dini, she was built in steel and aluminium by Italian yard CBI Navi to Lloyd's class and MCA compliant, with delivery in 2005 as the largest yacht ever built by the yard. 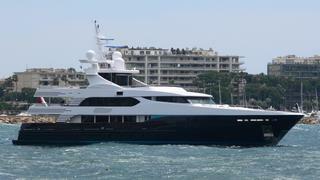 Alibi can accommodate 12 guests and has plenty of space for outdoor activities. There is a panoramic open deck area with half moon large sunbathing mattresses and an extendable table for 12 guests and a bar. Following a major upgrade to her sun deck in 2013, Alibi now features a variety of al fresco dining and entertaining areas as well as sun pads and sun loungers. The sundeck also boasts large cushions, a Jacuzzi, a U-shaped settee and another table for 12. Alibi also features a gymnasium and a garage that holds a tender, three jet skis and more. Inside this superyacht are six staterooms comprising a full-width master suite with an office and a Jacuzzi tub, two VIP cabins with Jacuzzi baths and two double and one twin guest cabin, all with en-suite bathroom facilities. Twin Caterpillar 3516B diesel engines give her a cruising speed of 13 knots and a range of 4,000 nautical miles at 10 knots. Lying in Imperia, Italy, Alibi was asking €13.5 million.